In skillet, cook bacon until crisp. Drain on paper towel; crumble. In same skillet, cook almonds in 1 T. bacon grease. Shake over high heat until almonds are browned. 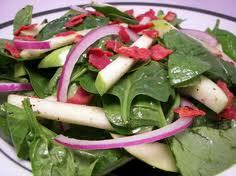 In large salad bowl, combine spinach with bacon, almonds, apple and onions. Toss with dressing.